Here's an interesting stat. it won't be long before SUVs account for a quarter of all car sales. And premium brands account for 11% of all worldwide car production but 37% of automotive segment profits. Which explains why the Peugeot/Citroen conglomerate needs the DS brand. 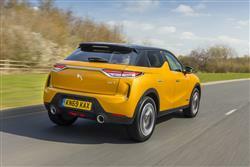 And why the DS brand needs this car, the DS 3 Crossback. It's taken the DS marque some time to get off the ground. The DS3, DS4 and DS5 hatches the company kicked off with were re-badged Citroens that struggled to justify premium pricing. But we were promised bespoke DS designs that would. The mid-sized seven-seat DS 7 Crossback was the first of these. 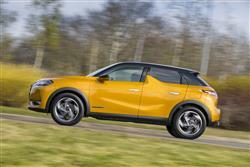 This smaller DS 3 Crossback is the second. Under the bonnet, things are fairly familiar - in the case of the combustion engines anyway. DS offers the PSA Group's usual three cylinder 1.2-litre PureTech unit in 100hp manual form (a six-speeder), or with 130 or 155hp mated to EAT8 eight-speed automatic transmission with column-mounted shift paddles. There's also a manual 1.5-litre BlueHDi 100 diesel, which is interesting because diesel power is rapidly becoming a novelty in the SUV 'B' segment. You might buy the diesel for its economy but its pulling power (250Nm) isn't very much different to what you'd get from the PureTech 155 petrol unit. As usual amongst premium models, you get a driving modes system, this one offering 'eco', 'normal' and 'sport' settings. The alternative to all these units is the all-electric 'E-Tense' variant you can ask your dealer about. This develops 132bhp and uses a 50kWh battery pack (mounted in an 'H' configuration below the front and rear seats) that allows for a claimed 186-mile WLTP-rated driving range. Torque of 260Nm allows the DS 3 Crossback E-Tense to sprint from rest to 30mph in just 3 seconds and reach 62mph in 8.7s. As is the current trend, there's plenty of semi-autonomous driving technology on offer (most of it optional). The 'DS Drive Assist' package combines 'Active Cruise Control' and 'Lane Keeping Assist' in a form that sees the vehicle managing both steering and speed. 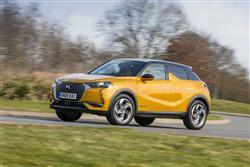 Styling's an emotive subject but most will probably agree that this car offers a more interesting take on 'B'-segment supermini-based SUV design. It's 4.17-metres long, 1.79-metres wide and 1.53-metres high, which means that it sits amongst the bigger contenders in this segment - cars like the Honda HR-V and the Audi Q2. 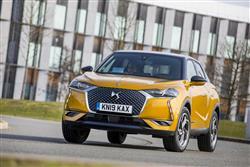 The DS 3 Crossback sits on the PSA Group's new CMP platform, the same as that used for new-era versions of the Peugeot 208 and the Vauxhall Corsa. Inside, there's an over-riding diamond-shaped theme - the digital instrument pack, the dashboard switches, the air vents and many other interior fitments all bear this shape. Cabin trim is based around your choice of five 'Inspiration' packages - 'MONTMARTRE', 'BASTILLE', 'PERFORMANCE Line', 'RIVOLI' and 'OPERA'. You get a reasonable array of storage compartments including cup holders and a broad, functional sliding armrest. The seats are particularly comfortable thanks to a special bi-density foam the brand has developed. But over-the-shoulder vision is somewhat compromised by the rear 'D'-pillar. In the rear, the window line in the rear is rather high, so if you've got kids, you might want to make sure they're OK with that. And the boot capacity, though reasonable at 350-litres, is a little down (50-litres) on what you'd get in a rival Audi Q2. 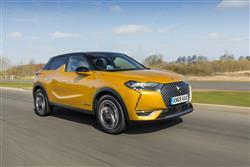 DS 3 Crossback pricing ranges from around £21,500 to nearly £33,000. There are four standard trim levels - 'Elegance', 'PERFORMANCE Line', 'Prestige' and 'Ultra Prestige' - which feature distinctly styled interior packages (DS calls then 'Inspirations'), most themed and styled around the perceived ambiance of various Parisian districts. Even 'Elegance' variants are well equipped, featuring 17-inch Grey Anthracite diamond-cut alloy wheels, rear parking sensors and a 'Safety Park', which includes an Emergency Braking System, Lane Keeping Assist, Speed recognition and Intelligent Speed Adaptation. Let's get to the exact figures that the DS 3's various engines can produce, all of which are helped by the light weight of this car's underlying CMP PSA Group platform. We'll quote WLTP fuel figures and NEDC emissions readings. The base 1.5-litre BlueHDi 100 manual diesel model manages up to 62.7mpg on the combined cycle and up to 97g/km. 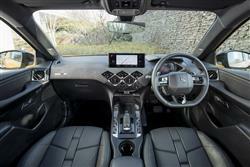 The alternative PureTech 100 petrol derivative manages up to 52.0mpg and up to 105g/km of CO2. For the auto PureTech 130, the figures are up to 47.1mpg and up to 109g/km. And for the auto PureTech 130 variant, you're looking at up to 45.7mpg and up to 121g/km. Few direct rivals can better these figures. 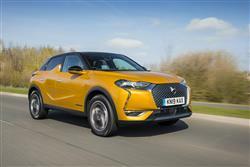 If you want to do better in a DS 3 Crossback, you need to be looking at the all-electric 'E-Tense' version, which uses a 50kWh lithium-ion battery that can be re-charged to 80% of its capacity in just 30 minutes from the right plug point. The 11kW wallbox that owners will want to fit in their garages will re-charge the car in five hours. When out and about, a 100kW public fast-charging point will perform a full charge in 90 minutes. With a fully replenished battery, 186 miles of WLTP-rated driving range is possible. 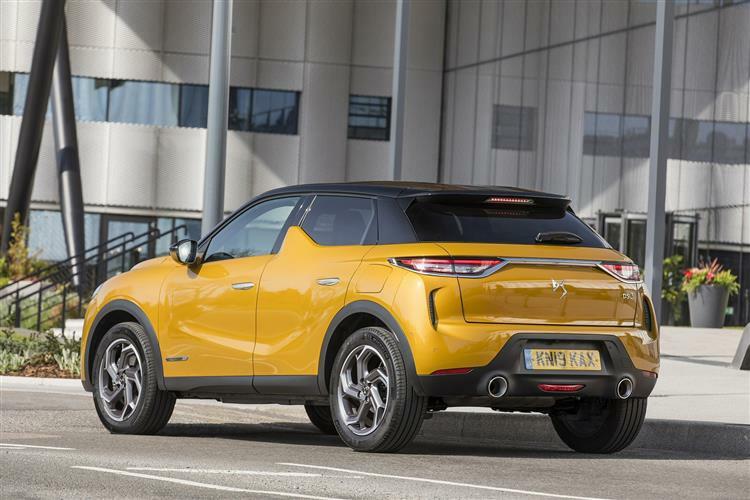 The money being asked here seems a lot for a supermini-based 'B'-segment SUV bu the DS brand isn't alone in putting forward that kind of proposition. And it's not one that's done similar crossovers like Audi's Q2 and the Volkswagen T-Cross any harm. But those brands have market recognition. DS is still seeking that - but ought to find more of it courtesy of this car. It has a special feel lacking from its German rivals - and its hybrid E-Tense electrified technology is ahead of them too. This car, like its brand, is aspirational. If you are too and you're shopping in this segment while looking for something a bit different, you might well like it.